It’s that time of year when, depending on where you live, the produce section of the grocery store can start looking a little bit homogeneous. For me, and those of you also residing in cold weather environments, it probably means you’re staring at rows and rows of hearty, wintery root vegetables. Now, I’m not really complaining. Because I love root vegetables of all shapes and sizes (even the funny looking ones!). But it can be easy to find yourself stuck in a cooking rut when the variety of produce tapers due to seasonal changes. 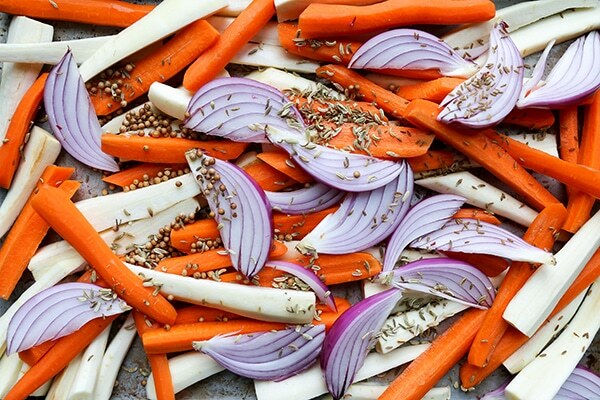 So I’m here today to shake up your usual roasted root vegetable routine with a few simple additions, including fennel seeds, coriander seeds, cumin seeds and a sprinkling of red wine vinegar and chopped fresh cilantro. These Spiced Roasted Root Vegetables are easy enough to be made and enjoyed on any weeknight. But I have a feeling that they might just become your new favorite holiday side dish as well. The flavors are unique and interesting, but the dish still has a familiar, comforting quality that a lot of people are looking for around the holidays. And dare I say that this is also one of those vegetable dishes that you could serve to a self-professed vegetable hater and successfully convert them? I think it just might be! There are a few key tips that really make this dish work. First, you want to make sure the carrot and parsnip pieces are all approximately the same size. I start by cutting them in half horizontally. Then I vertically slice the thicker top halves into 2 or 4 pieces, while the bottom halves are often thin enough to be left whole. Second, you want to give the vegetables plenty of space on their baking sheets so that they roast, instead of steaming themselves. I like to toss all the ingredients together on a single sheet first to make sure the olive oil and spices are evenly coating the vegetables. Then I distribute them between two sheets, spreading things out into a single layer. And third, don’t be afraid of a few blackened spots. That is how you get all those wonderfully complex, deep, caramelized flavors. And that is where the good stuff is! 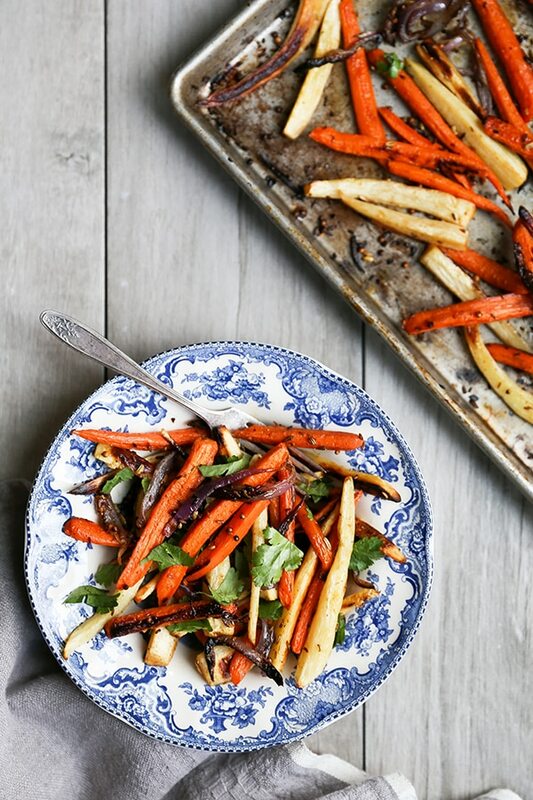 Ordinary roasted root vegetables get a makeover with the addition of fennel seeds, coriander seeds, cumin seeds, red wine vinegar and fresh cilantro. This recipe will quickly become your new go-to winter side dish! Preheat your oven to 425°F. Get out two large rimmed baking sheets. Add the carrots, parsnips and onion to one of the baking sheets. Drizzle the vegetables with the olive oil. Then sprinkle with the salt, fennel seeds, coriander seeds, cumin seeds and black pepper. Using your hands, toss everything together until the vegetables are well coated. Then transfer about half of the vegetables to the second baking sheet. Spread the vegetables out so they are in a single layer. Transfer the baking sheets to your preheated oven. Roast the vegetables for 15 minutes. Then stir them and rotate the two baking sheets. Continue roasting for an additional 10 minutes. The vegetables should be tender and starting to darken in places. Remove the baking sheets from your oven. Sprinkle the red wine vinegar over the vegetables while they are still warm. Top with the chopped cilantro and serve. Mmmm Root veggies are so good this time of year and I love how you infused them with seeds and spices, Liz. Delicious and colorful! So good to see you on OMV!